While speaking at a national sales retreat for a manufacturing company last week, I uncovered a common pattern that was limiting the company’s growth potential. Their team consisted of seasoned sales professionals and executives with a solid track record of performance. The company’s leadership felt the best way to ensure success was to define monthly targets for the number of phone calls, meetings, and proposals for each representative. Though their team consistently hit the targets for these activities, they were falling short of their revenue accomplishments. Why? When you focus on activity, that’s likely what you’ll get. It is easy to make one hundred phone calls in a week. All you would need to do is make two and a half calls per hour in a forty hour week. However, the same person who could make one hundred phone calls would have a much tougher time having five conversations with individuals who were emotionally connected to whatever you might be selling. How can you connect the dots between what you sell and the client’s emotions? Do you need to consult with Oprah? I was inspired by a recent post from Seth Godin. If you don’t already subscribe to his newsletter, stop reading this article, subscribe to his newsletter, and then come back to finish… I’ll wait. Seth explains that people are governed by six emotions: Anger, disgust, fear, happiness, sadness and surprise. People justify business purchase decisions rationally, but the core of their decision happens emotionally. Recognize that if you do not make a conscious effort to uncover an emotional connection to something important to your potential client, your message will fall on deaf ears. I suggested that he think of a specific target audience, and craft the message accordingly. We decided to target couples who recently became empty-nesters after their children completed school. “Couples come to me when their children have left their home, and they don’t want the burden of taking care of a big house. They want to enjoy life and be able to leave for a trip on a moment’s notice. They don’t’ know their best options, and don’t know what it would take to sell their house and find a suitable home for the next phase of their life.” This simple statement taps into the fear of not being able to take care of their home and the fear of not knowing their options. It also connects to the happiness associated with travel. When you craft your message to tap into emotions, be sure to ask the following question: On a scale from 1 to 10, how important would this issue be to your potential client? If the value is less than seven, you are likely not connecting to something that would warrant an investment or change. Disgust, fear, and anger tend to drive decisions faster than happiness or surprise. But, I suppose if your customer is surprised by something disgusting (like a backed-up sewer line), they just might seek a solution with urgency. When an opportunity appears stalled, take a step back and look for the emotional connection. 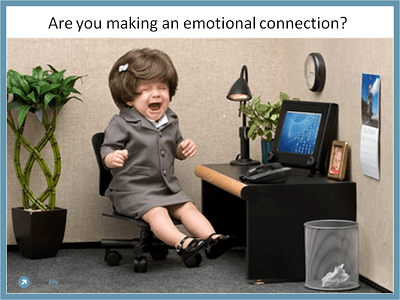 Where has emotion been a key factor for you as either the buyer or the seller?